SAFETY WARNING: The UV lamp should automatically turn off, when the imager door is opened. However, as a safety precaution, you should wear protective goggles. You should also wear protective gloves against chemical contaminants such as ethidium bromide. Open the door of the gel imager. Make sure the white light pad is not on the imaging area. If it is, remove it and place it in the cabinet below the imager. Remove your gel from its container and place it directly on the glass. Center it on the imaging area. Close the door of the imager and turn the dial to TRANS UV. Open the Kodak 1D 3.6 application from the desktop. Click on the “Capture GL 200” button at the top left. In the Capture (Gel Logic 200) window, select “SYBR Green” from the “Custom Settings” menu. Click on the “Preview” button at the top right. The camera will begin taking live images of the gel. If the gel image is too big or too small, manually adjust the size at the camera level (the middle ring). A setting of about 30mm works well. Focus adjustment is also done manually at the camera level (bottom ring). Set at approximately 5mm. There is only one focusing ring (no separate coarse and fine controls). NOTE: The “coarse” and “fine” adjust buttons on the computer screen control exposure time (not focus). Using the top ring of the camera (above the UV light chamber), open the lens aperture to its maximum. Due to the increased light intensity, the bright bands will be saturated. However, this will allow you to see the weakest bands. Now set the aperture to the desired opening size (f-stop) for best overall image appearance (usually, around 2–4). Fine-focus the image using the bottom ring of the camera lens. NOTE: The middle ring is a zoom control for changing the magnification of the image. For BISC110/112 nucleic acid gels, an exposure time (shutter speed) of 1.0sec is a good starting point. If you increase exposure time and the gel turns red, that means the signal is saturated. Use the “fine” adjust button to decrease the exposure time, until the red disappears. Alternatively, if there are some very faint bands on the gel which you need to see, even at the expense of brighter bands being overexposed, you may want to uncheck the “Show Saturation” box, so that the red color is not displayed. When you have finished adjusting your image, click on the “Capture” button (below “Preview”). A snapshot of your gel will now appear in another window called “NewProject 1*.” An “Image Display” window also appears at this time. You can change the brightness/contrast here using the “image histogram.” Under the “Display” menu, you can invert the image to save printer toner or ink. To save your data: Select File > Export Data > Image. From the “Save as type” menu, select JPEG and save your image to the desktop. This computer is networked to the SCI 314 printer, so you can print out a copy of the gel image. You should also transfer your file to your FirstClass account, or place it directly into your BISC 110 lab conference. Please do not leave un-filed images on the desktop for an extended period. Close the NewProject 1* window. Go to step 5 of the instructions for the next gel. This imager is located in the BISC Equipment Room, L308 next to the Kodak Gel Imager. 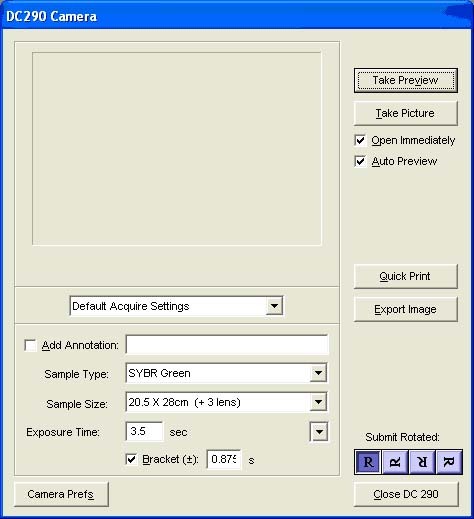 Note that the Invitrogen Imager can only take images that are stained with Sybr Green. Like the Kodak, the Invitrogen imager uses a UV light source; therefore, make sure the UV light is OFF when placing or removing gels under the protective orange shield. Make sure the PC computer to the left of the Invitrogen Safe Imager is on (Password dre303). Power on the DC290 digital camera above the imager by pressing the black power button on the front of the camera. A green blicking light will appear on the top of the camera as the camera boots; wait until the green blinking light disappears (it takes awhile-be patient). Double click the Kodak ID-3.6 icon on the desktop of the computer to open the imaging software. Make sure the UV light is OFF (on/off switch on the front of the imager box). Remove the orange plastic safety cover and place your gel directly under the camera lens. Turn on the UV light with the O/I toggle on the front panel of the imager box. Click on the Capture DC290 button near the top left of the screen that appeared when you opened the camera software. Adjust the exposure time, sample size, or move your gel to center it in the frame. A snapshot of your gel will now appear in another window called “NewProject 1*.” An “Image Display” window also appears at this time. You can change the brightness/contrast here using the “image histogram. To save your image: Select File > Export Data > Image. From the “Save AS” menu, change the name of the file with your initials or some unique identifier and select JPEG for file type. Then save your image to the folder for your lab section found in the BISC110/112 folder on the desktop. This computer is networked to the SCI 314 printer, so you can print out a copy of the gel image. You should now open FirstClass and transfer your image file to your FirstClass account. Please do not leave image files on the desktop! Those that are not filed appropriately will be deleted. Close the NewProject 1* window choosing DON’T SAVE. Your image has already been saved with your chosen file name in your lab’s BISC110/112 folder. Make sure to Power OFF the camera by holding down the black button on the front of the camera for ~3 seconds. This page was last edited on 6 December 2010, at 10:55.